Summer is great time to get together with friends and family. The best thing about having a party in summer is that weather permitting, you can have the party outside. I'm going to go over all the essentials of how to host an amazing backyard party this summer. There are so many tasty things to cook at a backyard party. If you have a grill, you may get to cook most or all of your items outside. Ask guests ahead of time if they have any allergies. A peanut allergy could mean life or death for someone who is allergic. So it is better to side with caution and ask. Also, you may want to have some vegan and vegetarian options. I'm going to share some recipes here that are sure to be favorites. Heat the oil in a skillet over medium-high heat. Add onions and cook until they soften, about 3 minutes. Stir in the garlic and cook for 2 minutes more. Put half of the onion mixture into a food processor with the black beans, chipotle pepper, 2 tablespoons of the lime juice, cumin, water and salt. Puree until smooth. Set aside. Add the corn to the skillet with the remaining onion mixture and cook for about 3 minutes. Remove from the heat and stir in the cilantro leaves. In a small bowl mash the avocado with the remaining lime juice. In a medium bowl toss together the tomatoes, scallion and jalapeno, if using. Season tomato mixture with salt and pepper, to taste. 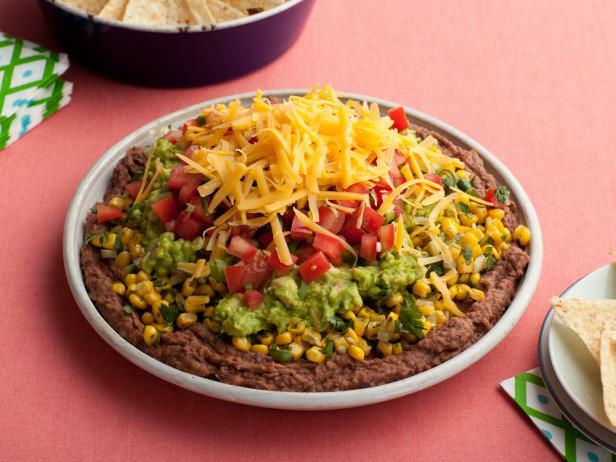 Spread the black bean dip into the bottom of an 8 by 8 glass baking or serving dish. Top with the corn mixture, spreading it out to form a single layer over the beans, repeat with the avocado, then the tomatoes. Top with cheese. Serve with baked chips. Use a mandolin or slice zucchini as thin as possible. In a small bowl whisk olive oil and vinegar together. Place zucchini in a large bowl and toss with oil and vinegar. 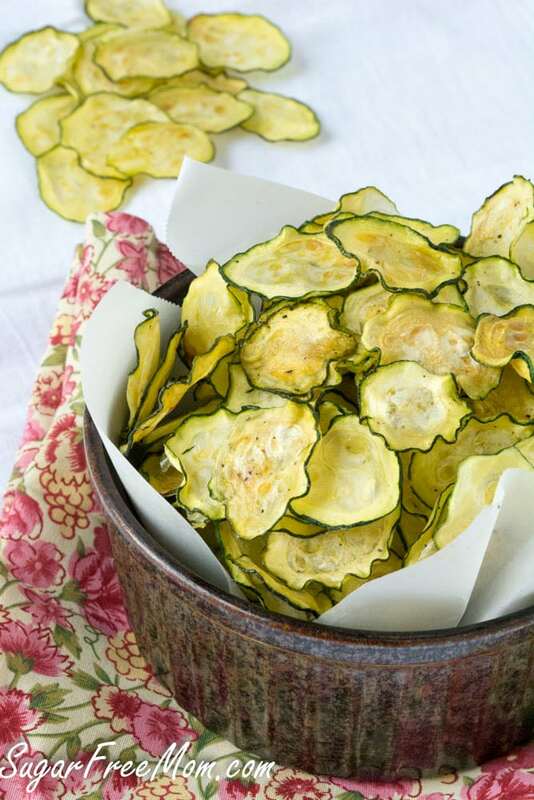 Add zucchini in even layers to dehydrator then sprinkle with coarse sea salt. Depending on how thin you slice the zucchini and on your dehydrator, the drying time will vary, anywhere from 8-14 hours. My temperature setting was 135 degrees F.
To make in the oven: Line a cookie sheet with parchment paper. Lay zucchini evenly. Bake at 200 degrees F for 2-3 hours. Rotate half way during cooking time. Store chips in an airtight container. In a medium bowl, whisk together the chili sauce, beef broth/water, oil, and soy sauce. Reserve half of the mixture. Toss the beef with the remaining sauce. Marinade for at least 1 hour. Preheat the grill or broiler. 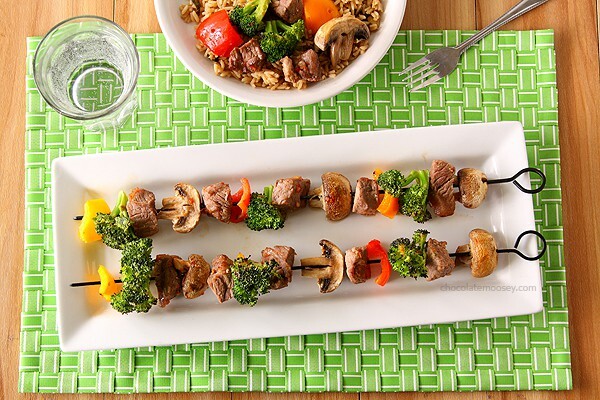 Alternatively thread the beef, broccoli, pepper, and mushrooms onto skewers (if using wooden, soak them in water before grilling). Grill covered over medium heat (or broil) for 5-6 minutes on each side or until meat reaches desired doneness and vegetables are crisp tender, basting occasionally with reserved marinade. Serve over hot cooked rice. Make your yard glow by lighting up your trees with lights. It shouldn't take too long to wrap the lights around the trees. You may want to ask some friends to arrive early to help you string the lights around the trees, as well as help you take them down. 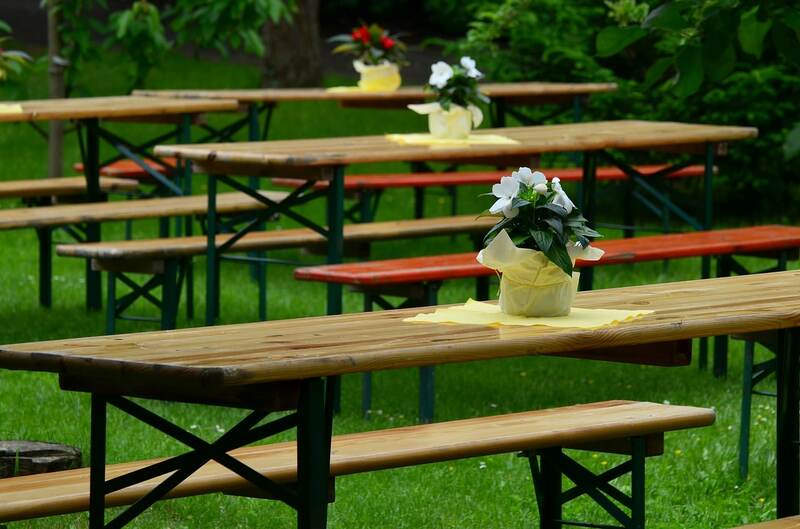 Having extra help will speed up the process of preparing your yard for a backyard party. Balloons can make your backyard party extra festive. 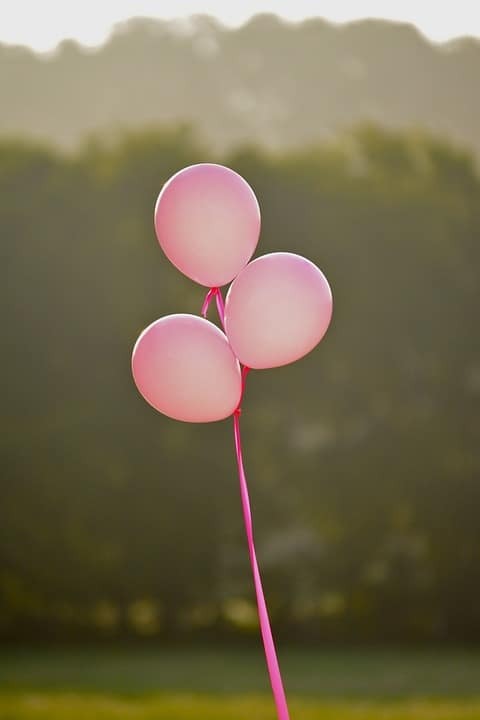 Good places to put balloons are around the table, along your fence, and on any posts that are around your house. Make sure you tie the balloons well onto the surface, so that they don't blow away. One simple way to decorate above the table is to run a string across the table (tie each side to a post, fence, etc. ), and fold bandanas in half diagonally. Before you hang them, connect them together by tying the ends together. Mix and match the colors to make your party extra unique and fun. It can be fun to have a craft station at your party that is fit for both adults and children. I'll go over two DIY Craft ideas that you can either have at a craft station, or you could do a demonstration on how to make them. Tie a string on a pinecone (the larger the cones, the better). 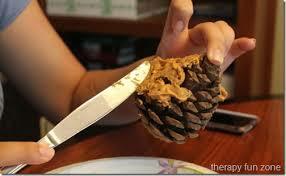 Smother the pinecone in peanut butter and then roll it in birdseed. Have sandwhich bags ready so that guests can put their creations in bags to take home. Because this can get messy, this is a great craft to do outdoors. Blow up a balloon and then cover with strips of newspaper that are dipped in a paste made from flour and water. Cover the balloon completely with the layers of the newspaper paste strips. Hang to dry. Cut a small hole in the pinata and stuff with candy and prizes, then tape it shut. Paint the pinata with tempera paints. Guests can take them home, or you may want to crack some pinatas open at the party. To open a pinata: Blindfold a guest, spin them around and then give them a bat to take a swing or two at the pinata. Guests take turns being blindfolded as they swing at the pinata until it spills out the candy. Anyone can run to get the candy that falls on the ground. Have a budget and stick with it. If you don't write down how much you plan on spending, nor keep track of what you are spending, you can quickly spend a lot more money than you planned for. First decide how much you want to spend as a total. Then begin to break it down in to sections such as: Food, drinks, favors, and miscellaneous. Play around with the numbers ahead of time and be flexible by spending more or less in a category. But try to stay within your total party allotted amount. Here are some ideas for party favors that are good for all ages. Small potted plants - Buy packs of inexpensive flowers like marigolds. Put them in little cups or extra small terra-cotta pots. Lavender Sachets - Buy lavender buds in bulk (ebay is a great source) and then put in sachet bags (again, ebay sells these in bulk). Or you may want to just buy a bulk order of lavender sachets already made up. Candy - You can't go wrong with candy. Have little baggies filled with candy to hand out to guests. If you want to keep the peace with your neighbors you may want to let them know that you are throwing a backyard party. This is a courtesy that you may want to extend so that they can expect extra traffic and noise. If you are on good terms with your neighbors, consider inviting them over to the party. Even if they don't show or accept the invitation, they may be less inclined to complain if things get a little loud. Unless you don't mind being up after midnight, you may want to be clear about when the backyard party is scheduled to be over, before guests arrive. You can do this by printing a beginning and end time on your invitation, or by being clear when you do the verbal inviting of guests. Don't assume that everyone will take a hint if you dim or shut off lights. It's better to be upfront ahead of time. Some people will appreciate knowing the backyard party hours so that they can plan accordingly. Unless you don't mind cleaning up all the mess yourself, have plans for a clean up crew. This could be friends, family members, or even neighborhood kids that might want to earn some extra cash. Don't make having fun more work than it needs to be. The more planning ahead that you do, the less work waiting for when the backyard party is over. 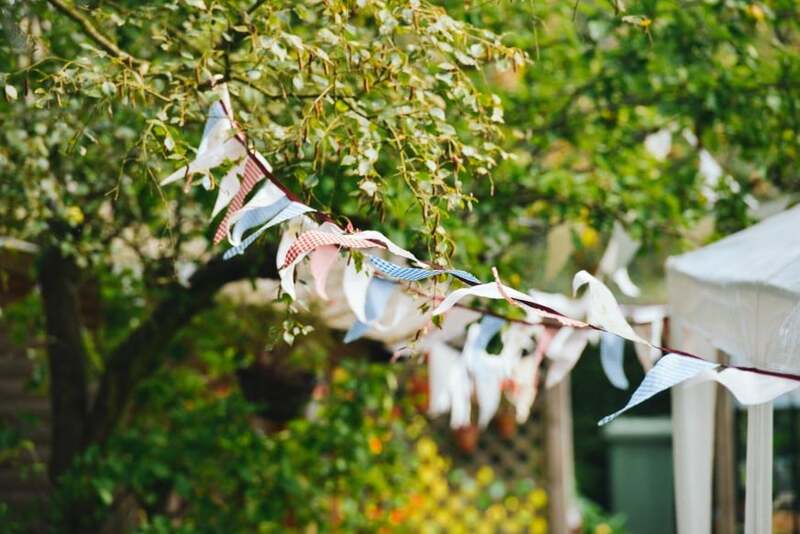 I've gone over some of the main elements of hosting a great summer backyard party. Make sure to have some yummy food, games, and crafts planned for your guests. Decorate to make it festive. If you don't have enough chairs, ask guests to bring them or get creative by making chairs out of things like hay bales with blankets. If money is a concern, make sure to outline a budget beforehand. Let close neighbors know your plans and be clear on your invitation about when the party starts and ends. But most of all, make your backyard party unique and fun for all.